In today’s connected world consumers are overwhelmingly looking for security. They very well know and understand that a breach with one device can infect other connected devices. This also makes them conscious of accessing only those links that ensure cyber-security. Organizations too are rapidly embracing cyber-security to ensure their business data, consumer data and a consumer’s faith in their organization are protected from cyber-crimes. For organizations it is not just a matter of business continuity but a matter of survival since they are realising differences between http vs https. To ensure data protection and to restore faith in consumers’ mind, a growing number of organizations are getting Secure Sockets Layer (SSL) to their domains. Though symbolic of moving from HTTP (or Hyper Text Transfer Protocol) to HTTPS (or HTTP Secure), SSL is a standard security technology that enables organizations to establish an encrypted link between a web server and a client. This makes it impossible for attackers to intercept the data flow (between a web server and a client) and use the information. SSL is an absolute necessity for e-commerce or for organizations that collect sensitive data. 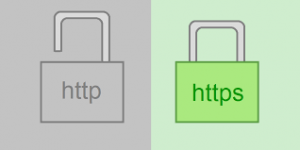 There are numerous benefits of switching to HTTPS. Web-search giant, Google & Mozilla has been explicitly endorsing the move as they believe HTTPS protects the domain from “eavesdroppers” thus protecting information about the user’s browsing activities. Google in its HTTPS website migration guide has clearly stated that data sent using HTTPS is secured via Transport Layer Security protocol (TLS), thus the data cannot be altered or rerouted without being detected. Google’s open endorsement to HTTPS website also shows their preference and is evident in their listing of search results – HTTPS sites are ranked higher than others. Switching to HTTPS may thus give you a small boost in ranking today and possibly a larger boost in the future. Switching from HTTP to HTTPS i.e HTTP vs HTTPS, is easy and cost effective considering the business benefits it gives. To have a HTTPS domain you have to first get an SSL certification either from your hosting company or from a third party website. But before you go buy, you have to decide on what exactly you would want to be SSL validated – Domain validation (this covers encryption only), Organisational validation (a bit costlier than domain validation but includes Organization Authentication), and finally Extended Validation (it ensures best security and is a must for Banks and eCommerce businesses). In most cases the SSL certification vendor also helps portals to install SSL certificates; it best to enquire this before buying from the vendor. Once this is over, you need to create a link map of your sites and redirections. This can be a time consuming step and depends on the complexity of your website. Ensure to update your internal links too. The images, style-sheets and scripts also need to be updated with the HTTPS tag just to ensure that all files used on your site have the https link. Switching from HTTP to HTTPS can be a daunting task for new companies; however, the merits are limitless. It is best to get an expert on board to help you with the transition. This will allow you to focus on your core activities while getting an SSL certified domain in the market that is trustworthy in your consumers’ mind.